Nickname "The Darling of Dublin"
Achievements Became the first man to have won both the Amateur World Championship and the Professional World Championship, when he lifted the Crucible trophy in 1997 after ending Stephen Hendry's five-year spell in the competition. (He has also won the World Under-21 Championship!) The following year he was runner-up to John Higgins. 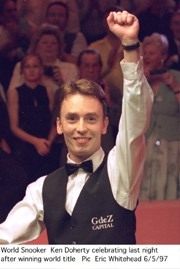 Ken Doherty's other ranking wins came in the 1993 and 2001 Welsh Open, the 2000 Rothmans Malta Grand Prix and the 2006 Malta Cup. Among his 16 titles are also the 1996 European League, the 1997 Rothmans Grand Prix and the 1998 Doc Martens Premier League. Miscellaneous Doherty was originally beaten by Ronnie O'Sullivan in the final of the 1998 Benson & Hedges Irish Masters, but was awarded the title after Ronnie failed a drug test. See Doherty's profile in the Score Centre for results from 2010/2011 and onwards.